Of course it’s not OK, and most CEOs would bristle at the thought. Sales professionals, talented as they may be, don’t have the perspective to formulate and implement the company strategy, and likely have no experience doing so. While many CEO’s focus on addressing organizational problems, the most successful focus on raising the bar. 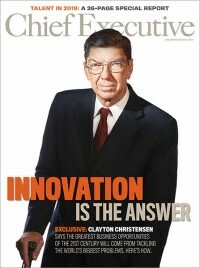 One of the ways they look to raise the bar is by creating a culture where innovation thrives. When this organizational strength is magnified it can become a source of competitive advantage for the enterprise.